Great tips for effective lock system as given by experts are found on this page. Listed below are situations when most break-ins occur. Take extra caution during these times for the safety of your home and belongings. • When you are away for a long vacation - keep your staff aware of your absence. • When you have recently fired an employee. • When multiple keys are circulated – take time in knowing the people who are in charge of the keys. If you are running a business establishment, there are times when you are at a high risk for break-ins. Listed below are situations when security breaches are common. Keep a heightened security during these times for the safety of your business and the information inside it. • If you have recently fired an employee, he may find your action unjust and seek for retaliation. • Your building is also vulnerable when you are out for a long vacation. Instruct your staff to be always open for possible break-ins. Quite often, property owners concentrate on the main building but our contractors advise that the external units require similar protection with a sound key. This is because they too contain some valuable items such as bicycles and garden tools. Install a strong weather-proof security lock. Children are curious by nature and will try to imitate adults. Install cabinet locks to avoid seeing your kids swallowing the same medicine you take. Remove keys from the door locks so they won't open the door and leave without your permission or open the door to strangers. Always keep keys out of their reach. 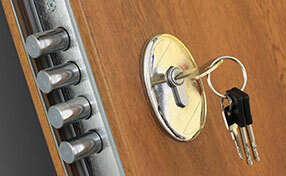 Do not hide the primary key to your home conspicuously over or under an obvious place. That is the first place they will look.